Prestigio has showcased there upcoming Windows smartphone at Computex 2014. 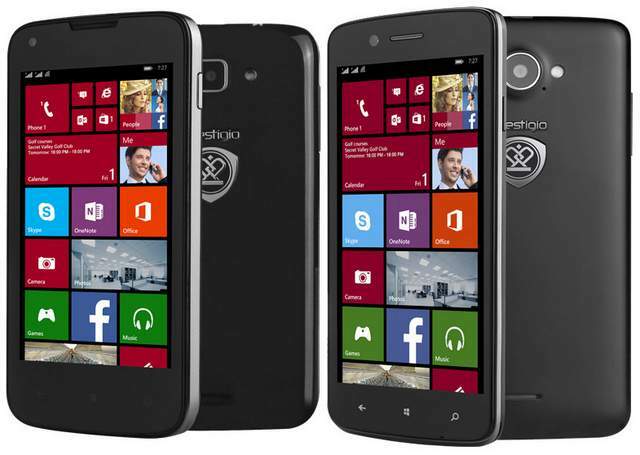 The Prestigio Multiphone 8400 DUO and Multi-Phone 8500 Duo will be the upcoming Windows 8.1 smartphones from the comapnay. The Multiphone 8500-Duo and 8400-duo are powered by 1.2GHz quad core CPU and runs on Windows Mobile phone 8.1 OS. Both are DUAL SIM Smartphones and has 8-megapixel rear camera with flash. The Prestigio 8400 Duo comes with a 4inch display having 480 x 800 pixels IPS display. It has 2-megapixel front shooter and a 8-megapixel rear camera. The Multiphone 8500 Duo is accomplished with 5 inch HD display with corning gorilla glass protection having 1280 x 720 pixels resolution. It has 1GB of RAM and 2MP front imager. Both features 3G, WIfI, Bluetooth, GPS and micro USB. The 8500 Duo is priced at US $235 and 8400 Duo cost you US $ 115. Both will be available in Black and white colors. The phones will hit the UK ( united Kingdom ), Austria, Netherland, Poland, Nigeria, Austria, Bahrain, Belarus, Belgium, Bosnia and Herzegovina, Bulgaria, Colombia, Croatia, Cyprus, Czech Republic, Egypt, stonia, France, Germany, Greece, Hungary Ireland, Italy, Span, The Kingdom of Saudi Arabia, The United Arab Emirates, Turkey and Ukraine before August 2014 ( release date / launch date ).